Ask five people in your office for lunch ideas, and you’ll hear raves. This restaurant has the best (fill-in-the-blank). The staff makes that restaurant a fun place to eat. Free drinks are available at another. By giving these recommendations, your staff has noticed what Baer & Lemin call “talk triggers,” or differentiators that create word-of-mouth buzz. Talk triggers are “built-in,” say the authors, but they don’t come naturally. You get them by utilizing what truly sets your business apart from competitors; or by creating a thing or reliable, consistent event that does. Remember, “same is lame”; if your competition can also lay claim to your boasts, then you need something else that makes you stand out, something that’s not “a stunt or a campaign or a slogan.” Make it “you,” thereby giving people reason to talk, blog, or post about you. • Be remarkable and don’t conform. • Be relevant and make sure your differentiator actually relates your business. • Be reasonable. You’re not Oprah. • Be repeatable by being ready to keep your talk trigger for awhile. Finally, preserve your work and your word-of-mouth momentum by knowing how to spot a formerly-successful talk trigger in fail-mode. It happens, and there are things you can do about it. 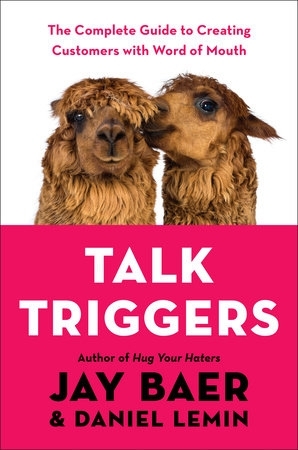 Beware of where you are when you start reading “Talk Triggers.” One strong breeze, and this dry-as-the-Sahara book might turn to dust. Indeed, despite the adorableness of the cover, it’s not a whole lot of fun to read. Then again, if you didn’t come strictly for fun, here’s your book. The authors offer many, many case studies to nicely illustrate how to make people rave about your business by being slightly, smartly outrageous on a long-term basis. The best thing is that the companies they profile aren’t the same ones you see in other books of this kind; instead, you’ll read about uncommon businesses that strongly, specifically exemplify the authors’ talk trigger methodology. Most delightfully, the authors implement their own advice, offering website freebies and a brazen back-cover offer that’ll leave you speechless. And yet, it isn’t for everyone. Remember, this book is on the dry side. It’ll cost to get free advertising, and it’s not free of work. Go into it with that in mind, though, and you’ll find “Talk Triggers” to be more than just blah.